Anyone else intrigued by this story? 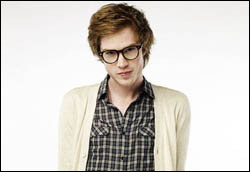 Cameron Mitchell, a 20-year old Christian and competitor on the Glee Project show, was increasingly challenged by the directors and producers to use sexuality as a tool. After a few episodes where things got heated, he squares off on his faith with Glee megamind Ryan Murphy. Cameron made the right choice and protected his faith. Cameron made the wrong choice and blew an opportunity to share his faith. Either way, Glee creator Ryan Murphy saw something rarely seen in this world – consistent Christianity. Hopefully that in itself is enough of a seed that if/when he does write a “Christian” character he uses a 3-dimensional template versus a 2-dimensional one. The real question underneath the question, however, is why you feel as you do and how your spin influences how you lead your student ministry.